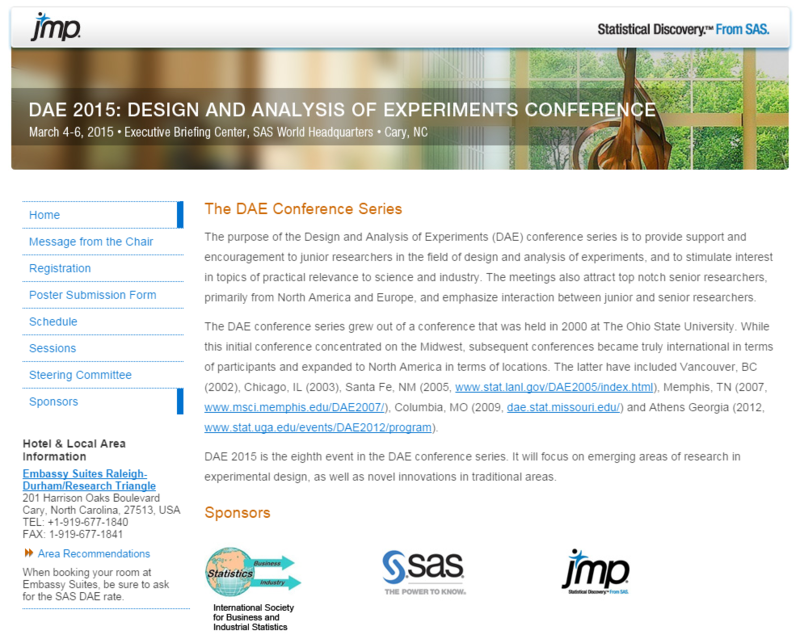 The DAE 2015 conference will take place March 4-6, 2015, at SAS headquarters in Cary, North Carolina. A long, long time ago, I was a new statistics PhD student attending my first conference. To say I was intimidated is putting it mildly: Top researchers in experimental design and analysis from around the globe were scheduled to be at this conference. How would I be able to talk to these people whose papers I’d been reading, and would they want to talk to me? Luckily for me, that conference was part of the Design and Analysis of Experiments conference series (DAE 2007 at the University of Memphis, to be exact). Not only does the DAE conference series attract some of the best senior researchers, a main theme is the support and encouragement of junior researchers. Junior researchers are well-represented both in invited talks and overall attendance. If you're interested, I invite you to read more about the history of the conference. Of course, talking to other researchers wasn’t so scary after all, but that realization was made so much easier because it was a DAE conference. Fate had a part to play at the DAE 2007 as well, as it was the first time I met Bradley Jones, who eventually brought me to JMP. I’m excited to announce that DAE 2015 is going to be held at the Executive Briefing Center on the SAS world headquarters in Cary, NC, from March 4-6, 2015. We’ve got a fantastic lineup of invited talks organized, and registration is now open. You can read more about the conference and register at www.jmp.com/dae2015. On the conference website, you’ll find that we’ve also opened up the poster submission form. The DAE conferences always have excellent posters, and next year's meeting should be no exception. If you have something you’ve been working on in the design and analysis of experiments, we would love to have you submit an abstract! We hope to see you in March 2015! I especially encourage young researchers to attend and take part in the mentorship activities that will be revealed later. It's a great chance to meet the authors of all the papers you've been reading in your research and meet other junior researchers, all while getting to hear about new and exciting research.